Singer ERIC WAGNER, formerly of TROUBLE and currently of THE SKULL, brings his unique and legendary voice to the new BLACKFINGER album, When Colors Fade Away, to be released Sept. 15th on M-Theory Audio. Now based in Pittsburgh, PA, Eric is joined by another familiar name in doom circles, guitarist Terry Weston (DREAM DEATH, PENANCE), and you can get the first taste of the group’s latest with the lyric video for the album’s opening song, and title track. Give it a listen below. The lyric video for “When Colors Fade Away" was created by Rafael Ortega (AYREON, HELSOTT, SUBTERRANEAN MASQUERADE) was premiered this week in the US courtesy of Decibel magazine and in Europe by Rock Hard. 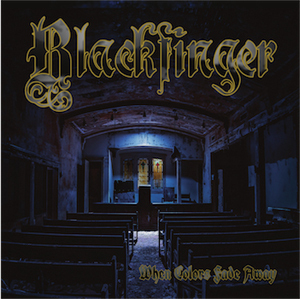 Watch for live show announcements from BLACKFINGER soon. M-Theory Audio is the new label recently launched by Marco Barbieri, the former president of Century Media Records, whose previous experience includes Nuclear Blast and Metal Blade. Joining Marco in this adventure are colleagues whose past experience includes work for labels like Century Media, Prosthetic, Victory and Epitaph. The label’s roster includes Mongolian/Nomadic Folk Metal band TENNGER CAVALRY, Traditional Metal Revivalists WHITE WIZZARD, Pagan Death Metal band HELSOTT, Las Vegas prog/power metal band SICOSIS, Black Metal Ritualists EMPYREAN THRONE and Nor Cal’s death/metalcore band APOTHESARY and more.